With a few down to the wire match-ups and a couple huge upsets, Round 2 fueled the competitive fire for the Round 3 match-ups. Number 5, 2K Marin, the developers of BioShock 2, upset Number 4 and March Mayhem veteran Harmonix. With the Boston rockers on their way home, 2K Marin will face off against last year's division champion, Nintendo. Chat about it here. Number 7 and tournament cinderella, Zynga, brought down Number 2 and tournament favorite, Infinity Ward. With the largest amount of votes in a single match-up yet this year, the real action happened in the forums where fans went back and forth in support of their favorite developer. That doesn't look like it's going to change in Round 3 as Zynga looks forward to locking horns with Grand Theft Auto developer, Rockstar North. Chat about it here. Number 3 seeded, Capcom, and Number 11, Obsidian, had fans casting votes up to the very last minute of the 48 hour period, only to have Capcom come away at the end with the win. Did Obsidian's valiant effort in Round 2 take any of the steam out of Capcom's sails as they heard towards Round 3 against Bethesda Softworks? Chat about it here. 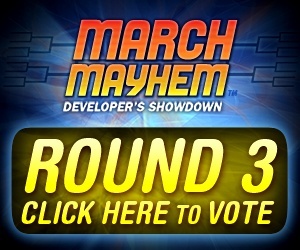 With 16 developers now vying to earn a spot in The Great Eight, Round 3 is going to be a breakout battle for every vote. Head over to the brackets NOW and vote for your favorites! Voting will be open until noon EST on Saturday, March 27th.